Many of us probably never noticed the twelve-story building on 111 Elizabeth Street. It was an architectural eyesore by all accounts -- ugly, forlorn, and for most of its existence, incapable of attracting tenants despite being located in the heart of the city. 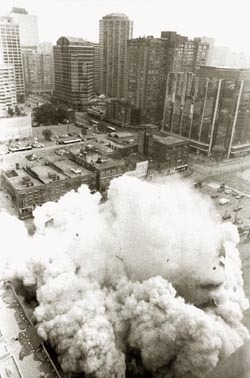 On June 6, 1999, 230 pounds of dynamite obliterated it from existence -- the first time an office tower in the city core has been razed using high-power explosives. Artist and researcher Lee Dickson has lived near 111 Elizabeth Street for 21 years, witnessing its effect on one of this city's oldest neighbourhoods. She retraces the remarkable history of an unremarkable building. Prelude Toronto has had a viable and vital Chinatown since the early 1900s, and Dundas Street West, between Bay and Elizabeth streets, was where it originally took hold. In the 1920s that narrow thoroughfare was a bustling neighbourhood of predominantly Chinese men who came seeking a living away from home. They had no intention of remaining, or of assimilating into Western culture. Character The Chinese ability to maintain their ethnic culture and strong ties to the homeland gave the area its unique quality. By the 1920s, businesses grew from exclusively laundries to restaurants and Chinese grocers. These small businesses literally became the kitchens and living rooms of the community. A meal in Chinatown was substantially cheaper than at non-Chinese restaurants, and as success draws visitors, Chinatown grew into a thriving tourist attraction. Within this self-contained community, the traditional associations based on the clan, or tongs (benevolent societies) developed strong networks and assisted new immigrants as they arrived. However, the infamous Exclusion Act of 1923 thwarted growth of the area dramatically. Until 1947, when the act was repealed, only forty-four Chinese entered Canada.1 Chinatown, however, maintained its vibrancy. Development New Chinatown, which spreads further along Dundas Street West and Spadina Avenue, is a result of redevelopment pressures on the original neighbourhood. As is well known, part of the legacy of New City Hall and Nathan Philips Square, which opened in 1965, included the expropriation of Chinatown from its southern portion. In consequence, developers assembled parcels of land that surrounded the New City Hall. 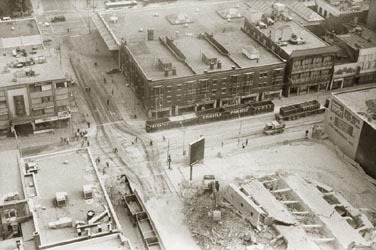 Their aim was to replace the low lying buildings in the area with highrise residences, hotels, and office towers.2 From the north, University of Toronto and Hospital Row further intruded on the residential area west of University Avenue. Threat Immigration increased dramatically after the Second World War and by the 1970s another influx of Chinese arrived via Hong Kong. These new immigrants were more entrepreneurial and established larger and more diverse businesses. But as businesses flourished, the future of Chinatown became an area of conflict between the elites of the traditional merchants and the new entrepreneurs, both vying for dominant control of the community. The City Planning Board was positioned as an ill-informed mediator further entangling the crisis. Development issues sparked around 1975 when a multimillion-dollar development for Chinatown was proposed by the Man Brothers. Three of the four proprietors of the most famous restaurants in the area (including the former "Mayor of Chinatown"), among others, accurately assessed that the ongoing crisis would hasten the shift westwards3 and threaten Old Chinatown with extinction.4 One result was the development of new chinatowns in other parts of greater Metro: the Gerard-Broadview area, Scarborough, and later, the affluent suburbs of Mississauga and Markham. Focus Twenty-one years ago I moved into a cheap but roomy one-bedroom apartment on the north side of Dundas. It affords a third floor view of bustling Chinatown and an expansive view of the city's skyline. The eye sore is the new twelve-story office tower of 111 Elizabeth Street, built in 1976, two years prior to my arrival. At close proximity, I face the north and east walls of solid grey concrete. It symbolizes the worst of what had become of Old Chinatown, thwarting the neighbourhood's unique blend of street level commerce, social community links, and tourist attractions. Still, the famous restaurants remained, including Lichee Gardens with its expansive ballroom-style dining hall fitted with a grand piano, delicious ethnic food, and exotic drinks decked with miniature paper umbrellas. Such restaurants could draw a cross section of clientele who would dress up for the occasion. Eviction As years pass, I witness shops moving further west. Lichee Gardens makes a fatal move to the lower level of Atrium on Bay. Within years its doors close with little notice. Rents increase disproportionately as leases expire. More commonly, stores close for good. The gambling joints, occasionally raided by police in the past, are shut down. Buildings empty of Chinese occupants and are left vacant. One by one, buildings are torn down and small parking lots grow into one mega-parking lot. Advertising signage appears in a big way (though not nearly to the same extent as the Yonge Street development also under construction). The new neighbourhood is dominated by parked cars and their alarms sound off regularly night and day. November, 1994 The film crew for the popular television series Kung Fu: The Legend Continues, starring David Carradine, uses the surrounding parking lot as a set with the northwest walls of the building as a backdrop. The theme of these shoots revolves around blowing up buildings from every possible view, and 111 Elizabeth Street proves to be a suitable location for destruction. I watch as they set up a whole Chinese market and then blow it up all in one afternoon. Sunday, June 6th 1999, 8:00 a.m. Only days before, I am told that 111 Elizabeth Street will be razed by means of implosion. While it is common in the United States to knock down buildings using dynamite, this is a first for a building to be instantly flattened with explosives in Toronto's downtown core. Two-hundred-and-thirty pounds of dynamite is carefully inserted in key points throughout the building's interior by the American firm, Engineering Demolition Inc.8 The building is detonated under excellent weather conditions, and at 8 a.m. on a Sunday when the surrounding offices are closed. Three intense sonic blasts precede the swift collapse of the building. Simultaneously, an enormous mushroom cloud rises. From behind my camera, on the 25th floor of the adjacent Colony Hotel, my heart leaps in my chest.9 Within seconds the view is obliterated by a white blizzard of concrete. Slowly, the ghostly remains of 111 Elizabeth Street become visible, and the surrounding vicinity is caked with a thick white dust. Clean up Immediately following, the area is a hive of activity. The demolition crew moves in to clear the debris. Adjacent buildings are unwrapped from their protective Polypropylene coverings.10 Street cleaners and the fire department arrive. After the success of such an intensively powerful event is completed, with few apparent hitches, there is a noticeable excitement in the air. Firemen hand over hoses to the excited work crew who robustly hose down the streets, sidewalks, and buildings, and the crunching up of concrete commences with intensity. Clean up continues for several weeks until the 25-foot high pile of debris is reduced to ground level. After the last of this rubble is removed, the surrounding parking lot consumes the space. On its first day, the new lot is filled to capacity. Aftermath Pending approval by City Hall, new construction is slated to begin. Starting on the north-east side of the lot, the first of three towers (26, 14 and 12-storeys) is proposed for the site, to be bounded by Bay, Dundas, Elizabeth, and Foster streets. Thus, more concrete and glass walls will be added to Bay Street's already alienating no man's land. The offshore Hong Kong corporation Champion Fine International Investments owns the site and proposes "to modify planning approvals to permit a smaller development than previously approved, but with greater flexibility of use and built form." This enables them to renege on their agreement with the city to build a portion of affordable housing on the site. Furthermore, it is rumoured that the city has renewed interest in the property. A new building accommodate some of the 50,000 civil servants of the amalgamated city is an option under consideration. Future It is clear that Old Chinatown has been lost. Is 111 Elizabeth Street an indication of the worst that can happen, or will the new millennium bring a plan with even greater lack of foresight? To replace such vibrancy within a city block is a challenge planners will likely never achieve, since a community's evolution is a natural growth. Will Old Chinatown be honoured as a historical site solely by its street signs? Furthermore, will the Dundas-Spadina Chinatown become threatened with the same kind of extinction? 1. An in-depth view of Chinatown's early history is found in Richard H. Thompson's Toronto's Chinatown: The Changing Social Organization of an Ethnic Community (New York: AMS Press, 1989). 2. "Chinatown: In danger within and without," Toronto Telegram (June 21, 1971): 19. 4. Newspaper clippings: Toronto City Core Planning Area, 1970-1979 (Toronto Urban Affairs Library/ Microfiche). 5. This story is well documented in James Dubro's Dragons of Crime, Inside the Asian Underworld (Markham: Octopus Publishing Group, 1992): 117-9. 6. "Man dies, 3 hurt in restaurant blast," Toronto Star, May 4, 1977; "Killing plot opens door on Metro murders, extortions," Toronto Star, Aug. 22, 1981; and others. 7. 1983 Toronto City Directory. 8. 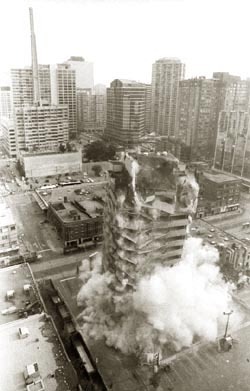 "The ups and downs, mostly downs, of demolition," Toronto Star (June 7, 1999). 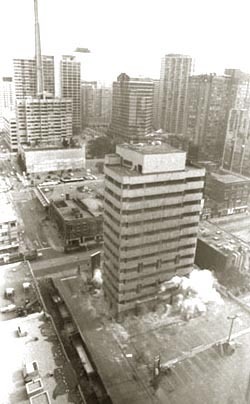 The City refused permission to two demolition companies hired in 1984 to flatten buildings on the present site of the Scotia Plaza, from "They plan to raze the roof," Real Estate News (September 21, 1984). 9. Thanks to Mr. Vic Priestly, of Priestly Demolition, I viewed this apocalyptic scene from his hotel room. Tenants in my building were asked to vacate in case of damage, which there was. One third of the windows in the front of the building were shattered from the implosion's impact. 10. Polypropylene is used to cover and protect buildings and assist in containing the dynamite blasts. In preparing a building for implosion, the building columns chosen to ensure collapse are first filled with dynamite charges, wrapped with chain link fencing, and then in polypropylene. Much has been documented about implosion. Of interest: Loizeaux, J. Mark & Douglas K., "Demolition by implosion: detonation of small quantities of strategically placed explosives can demolish an unwanted high-rise in a matter of seconds," Scientific American (Oct. 1995). Also, Cultrice, Curtis K., "Blasting a path to world markets: U.S. demolition exporter levels playing field," Business America (Jan.-Feb. 1997). Edited by Catherine Osborne. All photos by Lee Dickson. First published in Lola [Toronto] No. 5, Winter 1999-2000, 14-17. Re-published in Broken Pencil [Toronto] No. 13, Summer 2000, 37-39.